When the Institute of Medicine (IOM) speaks, people listen. When it releases a report, people read (and quite often develop policy around) its findings. In 2010 the IOM released The Future of Nursing Report, an exhaustive analysis of the current state of nursing in the U.S., where it was heading, and where it should go. The report touches on a lot, maybe most famously its recommendation that 80% of registered nurses earn their BSN degree by 2020. The IOM had many reasons for this recommendation, all of them logical, which is in part why we at Ameritech College of Healthcare launched our BSN degree completion program for RNs in 2013. We want to meet the needs of nurses and healthcare as a whole, and we agree with what the Future of Nursing Report says about the BSN degree. One of the more startling findings in the Future of Nursing Report was that only 2% of matriculating medical students planned to pursue primary care and general internal medicine, while the number of nurse practitioners and physician assistants had doubled between 1995 and 2009. The population of the U.S. also, of course, increased, which means there is a greater need for primary care. These figures predict that nurses and PAs will soon be responsible for a lot of healthcare in the future. This is good news, as long as there are nurses who are able to become nurse practitioners. 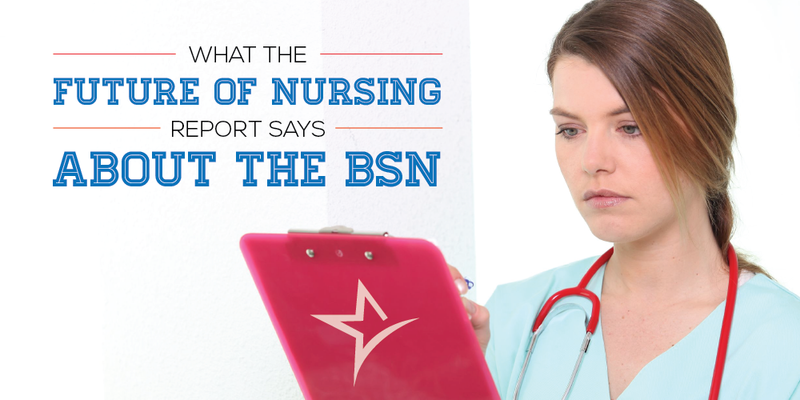 That Masters-level education is only available to nurses who already hold a BSN degree. If nurses are going to be responsible for more primary care in the future, they first need their baccalaureate degree in nursing. Nurses with an RN associate degree are capable of performing all typical nursing duties in their hospital or clinic, but the Future of Nursing Report acknowledges that won’t be enough as healthcare needs in the country change. In addition to emphasizing RN-BSN degree completion, the IOM also concentrated on higher education, in particular doctorate degrees in nursing fields. By 2020, the IOM recommended that the number of nurses with a doctorate degree double from the count of 28,369 in 2010. Higher level nursing education starts with earning a BSN degree, and at Ameritech we strive to make that and future education goals as seamless as possible. We’re thrilled that many of our RN graduates immediately begin to pursue their BSN online, and even higher education from there. The IOM recommended creating more seamless transitions between degree programs, and so we’ve started partnerships with other schools like Chatham University and Rocky Mountain University of Health Professions (among others), allowing our BSN students to pursue accelerated or reduced tuition graduate degrees as soon as they have their baccalaureate. We’ve written many times about the benefits of earning your BSN degree, many of which come from findings in the Future of Nursing Report and our own practical experience. Having a BSN degree doesn’t just better prepare nurses for higher education or more employment opportunities in the future (though it does); it makes nurses better at their work. The Future of Nursing Report found that failure to rescue rates decreased among nurses with at least a baccalaureate degree, but it also discovered the education makes nurses more confident in their work. With nurses filling such a pivotal role in the future healthcare field, the IOM argued that the nursing profession must generate leaders. All nurses must begin to think of themselves as important to patient care as any surgeon or physician. A leadership mindset, which a BSN education can help instill, improves teamwork, reduces medical errors, and increases job satisfaction among nurses. The IOM released these findings, and at Ameritech College of Healthcare, we couldn’t agree more. We care about the future of nursing, and we’re proud of the online degree program we’ve created to make the BSN more available to nurses all over the country. If you’re interested in preparing for the future as a nurse by earning your BSN, read more about the BSN program. Reach out and contact us if you have any questions. We’d love to hear from you!